Enoc Perez first approached us with a project during lunch at Felix on a sunny day in Soho, New York. His project, “Form by Memory,” is multimedia – with watercolors, digital photos, polaroids, sketches, photos of paintings in situ, and even drink stirrers from Puerto Rican hotels. A divergence from his architectural paintings created via brushless paint transfer, we enthusiastically accepted the project for zingmagazine #22 (due out later this year). ZING: What is it about architecture that interests you? Why use it as a subject for paintings? Enoc Perez: I see buildings as metaphors, as abstractions. I like how architecture can embody ideas, "the future", progress, enlightenment, optimism, etc. In fact it can project ideas in any direction. To paint architecture is to paint ideas. It is to paint an abstract reflection of current society. ZING: Do certain architectural styles appeal to you more than others? EP: Sure I like some architecture more than others but I find that there is a lot to like. Generally I like everything from Greek Architecture to Bauhaus, Modern, International Style, Mid-Century Modern, Brutalist to Green Building. I follow my attraction, my taste is a bit promiscuous. ZING: You’ve mentioned that there’s a utopian quality to your work – a belief in painting as opposed to questioning the medium. What, in your opinion, is the place of belief in art? EP: Belief is to me important in art. And I mean to believe in art. A significant part of the existence of art has to do with the artist believing in his or her art and those whom believe in the artist work. People believing in art is part of what brings art to life. My friend Tony Shafrazi once told me that art was "his religion". I think that comment goes to the heart of what I am trying to address here. It is the trust that art can make a difference, change or improve our perception of ourselves; the trust that art is important. ZING: Does belief extend to the viewer of art? EP: Of course, it is central for the viewer to be in it. It is a connection that completes the process. ZING: I’ve been a fan since you first proposed your project over a lunch in Soho. The multi-media project seems to showcase a process rather than a product. Is this a glimpse into your painting process? EP: I remember the lunch and yes this project is about some aspects of my painting process. I was just giving some physicality to my thought process. When it comes to my work, I am as exited about the process as I am about the finished idea. ZING: The drink stirrers are a great touch – they add tactile detail to the art deco modernist style you are surveying. Do you collect them? EP: I have a beautiful collection of drink stirrers. From all over the world, I think that I have over a thousand. I love them. 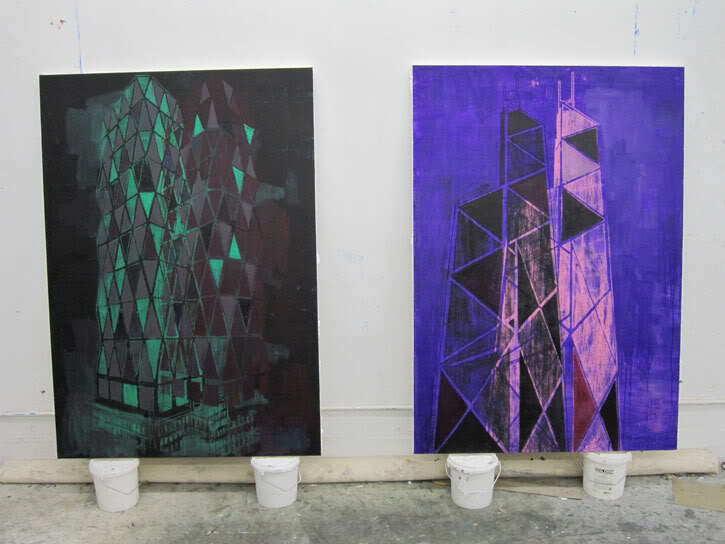 ZING: You have a series of architectural monochromes upcoming at Galerie Michael Janssen during Berlin Gallery Week. Why monochrome? EP: I wanted to see what I could do with a very disciplined palette. I also felt that it was important to untangle my painting process, break every rule that I had set for myself. For years I did not used brushes in the making of my paintings, the new paintings are done with brushes. I like the new work, making it has been renewing. Sometimes you have to burn your own house in order to create something new. ZING: Anything else you have coming up / are working on that we should know about? EP: Next year I have an exhibition in a museum in Murcia Spain called "The Cannery". I also have gallery shows in Europe and in NY. Enoc has new works on exhibit at Galerie Michael Janssen in Berlin through June 19th.